Facilities: USP Leavenworth, with an adjacent minimum security satellite prison camp. 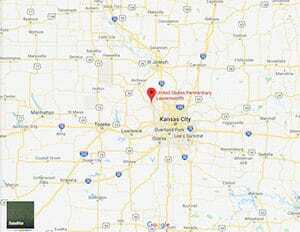 Location: USP Leavenworth is located 25 miles north of Kansas City on Highway 73. Background: USP Leavenworth opened in 1906 and was the first federal prison. The satellite camp opened in 1960. It is located adjacent to, and provides support services for, USP Leavenworth. Notable inmates include rap artist Troy Deon Reddick (released in 1996 after serving 4 years for robbery), businessman Tom Petters, known for running one of the largest ponzi schemes in American history (serving a 50-year sentence for conspiracy, wire fraud, mail fraud, and money laundering), leader of the Latin Kings gang Antonio Fernandez (released in 2009 after serving 10 years for conspiracy to distribute heroin and cocaine), and NFL quarterback Michael Vick (released in 2009 after serving 23 months for operating an inter-state dog fighting ring). Housing: Inmates in one-person and two-person cells. The camp houses inmates in open dormitories which contain 50 inmates each. Health Services: Health services include intake screenings, stress management, nutrition counseling, dental hygiene, urgent care, medical and dental care, chronic care, physical examinations, and medications. While emergency care is available 24 hours a day, inmates must submit a triage form for routine health care needs. Psychology Services: The USP Leavenworth Psychology Services Department is available to inmates Monday through Friday from 7:30 a.m. to 4:00 p.m. by appointment only. Appointments can be made by submitting a cop-out to Psychology Services or through the Unit Team or Health Services staff. Inmates experiencing an emergency situation (e.g., serious depression or suicidal thoughts) should report this to the nearest staff member and are generally seen immediately by Psychology staff. An on-call psychologist is available after hours to deal with emergency situations which may arise on evenings or weekends. Various services provided include individual counseling, crisis intervention, and special group programs. Among the group programs offered is Diversity in a Prison/Correctional Setting, which is offered several times a year, as well as the institution Admission and Orientation Program’s Sexual Assault Prevention and Intervention presentation. Through the Religious Services Department the Life Connections Program is offered for inmates who desire to grow as a responsible person. Residential Drug Abuse Program (RDAP): USP Leavenworth houses a Residential Drug Abuse Program (RDAP). A Drug Education class and the Non-Residential Drug Abuse Program (NR-DAP) is also available. Education Services: USP Leavenworth provides GED and English-as-a-Second Language (ESL) programs. Parenting and Adult Continuing Education (ACE) classes are also available. High school diplomas and post-secondary programs are available through paid correspondence programs. Advanced Occupational Education: USP Leavenworth offers advanced occupational education in Hospitality Employment and Retail Therapy (HEART) and Janitorial. Vocational Training: USP Leavenworth offers two vocational training programs, Graphic Arts and Custodial Maintenance. Apprenticeship: USP Leavenworth and the satellite camp do not offer any apprenticeship programs. Library Services: The law library is located in the Education Department, and contains a variety of legal reference materials for use in preparing legal papers. Reference materials include the United States Code Annotated, Federal Reporter, Supreme Court Reporter, Bureau of Prisons program statements, institution supplements, indexes, and other legal materials. Most of these are available on the TRULINCS Electronic Law Library. A copy machine and typewriters are available for use at the law library. The leisure library is available for inmates to check out leisure reading material, including both fiction and nonfiction books. Reference books, magazines, and newspapers are located in the library for reading in the Education Department only. Cassette players for language programs, audiobooks on cassette, and video monitors for the video library program are also available for inmate use. An interlibrary loan service is also available. UNICOR: The UNICOR facility handles recycling activities and services, and produces clothing and textiles. Commissary: Inmates at USP Leavenworth are allowed to spend up to $360.00 per month in the commissary on such items as food, clothing, drinks, over-the-counter medications, and electronics. Inmates tend to use laundry bags to carry their purchases back to their housing units. Recreation Services: A variety of activities are available on the USP Leavenworth recreation yard, second/third floor recreation, and in the gymnasium for inmates. Special events, including unit or institution-wide tournaments, are held throughout the year. The Recreation Department also allows inmates to take photographs through the Inmate Photograph Program at designated areas and schedules posted on the Second Floor Recreation. The Recreation Department has a Movie Program for inmates to view movies in the Auditorium. The list of movies and schedule of showings is posted outside the Auditorium. The Recreation Department also offers a Music Program that allows inmates to utilize musical equipment or listen to CD’s.